An-Noor is not only limited to learning the basics, we have many extracurricular activities during the year. 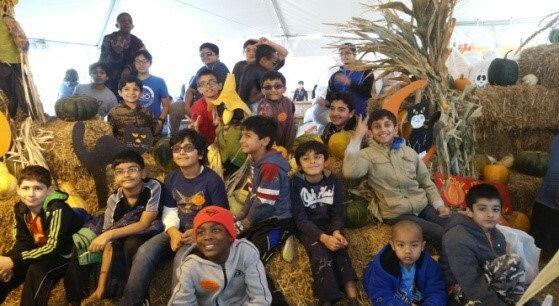 The students learn about farming life while having a great time. The students learned about direct and indirect bullying through the anti-bullying workshop in Poe Health Center. The students had fun skating at the United Skates while learning about STEM Engineering Magic and Lighting. The Spelling bee is an annual event that takes place in the Spring to teach competition and have confidence in themselves. 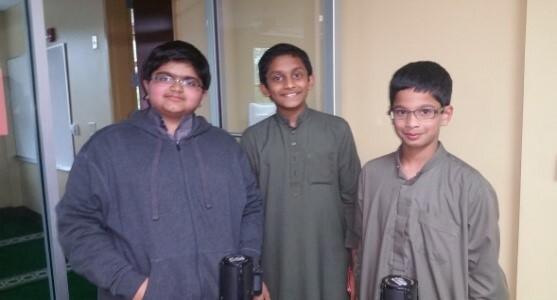 These students were the first place winners in the school wide spelling bee. Science Fair Projects require using the skills gained in Social Studies, English, Math, Technology and the Sciences. Science Fair Projects provide opportunities to collaborate with many teachers, especially in Science, Math, English, and Islamic Studies. They implement cross-curriculum and team leadership and cooperation. International Fair gives us knowledge about 32 different countries. The displays show and describe the countries their background. A STEM Club is any out-of-timetable session that gives school students the chance to explore aspects of Science, Technology, Engineering and Math. The STEM Club tend is not based on curriculum, but focuses on specific disciplines or go across STEM subjects. A STEM Club could be about Computer coding, Math puzzles, Robotics, Engineering, Chemistry, Astronomy or anything that falls within STEM subjects! The Health Sessions provide an educational learning experience from our beloved community doctor volunteers. In this session the students learned how to keep our eyes Healthy and Safe with Dr. Nouman Siddiqui. Learning that doing small things like selling calendars teaches our students that they can make a difference in the world. Especially, when the money is for a great cause like sponsoring orphans.